A1 contains sample from "Do or Dye-Bed Stuy" by Divine Sounds and "Super Cas Anova" by Super Lover. A2 contains a sample from "The Next Level" by The Alkaholics and elements from "I Love You More Than You'll Ever Know" by Lydia Pense & Cold Blood. A3 contains a sample from "Only Love Is Worth This Pain" by Country Joe Macdonald. B1 contains a sample from "Competition Catch Speed Knots" by The Constant Deviants. B2 contains a sample from "Mary Miles" by Blood, Sweat and Tears. B3 contains a sample from "World Called Love" by Brian and Brenda Russell and "Keep In Touch" by Robert Palmer. C3 contains a sample from "Cranium" by Gauge and "How You Want It I've Got It" by Jungle Brothers. D3 contains a sample from "How I'm Livin" by Jeru, "Miss Vicki" by The Stanley Cowell Trio and "Champolic" by Gerry Mulligan. Does not include a 13th track "Spellbound" (Feat.Veba), featured on other formats. Debut album by Rae & Christian. Includes work with Texas, on 'The Hush' and The Jungle Brothers on 'Play On'. 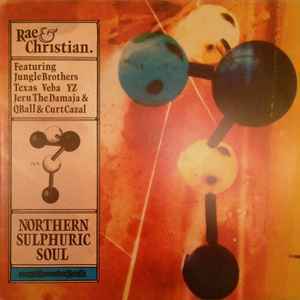 and Veba (Veba had hit R&C's world and the trio went on to work on 'Spellbound'; 'All I Ask'; 'Fool' and 'Divine Sounds' )- The collection of tracks on Northern Sulphuric Soul combined the hip hop ethic with traditional song writing skills and nineties production technology. Other collaborations include NYC's Jeru The Damaja, Q'n'C and YZ from New Jersey. From Grand Central Website.